HEIGHT: Not exceeding 13.2 hands high (137.2 cms). GENERAL CHARACTER: Hardy, spirited and pony-like. COLOUR: Any colour, except piebald and skewbald. HEAD: Small, clean-cut, well set on and tapering to the muzzle. EARS: Well-placed, small and pointed, well up on the head, proportionately close. JAWS AND THROAT: Clean and finely-cut, with ample room at the angle of the jaw. NECK: Lengthy, well-carried and moderately lean in the case of mares, but inclined to be cresty in the case of mature stallions. SHOULDERS: Long and sloping well back. Withers moderately fine, but not “knifey”. The humerus upright so that the foreleg is not set in under the body. FORELEGS: Set square and true, and not tied in at the elbows. Long, strong forearm, well developed knee, short flat bone below knee, pasterns of proportionate slope and length, feet well-shaped and round, hoofs dense. BACK AND LOINS: Muscular, strong and well coupled. HIND QUARTERS: Hocks to be large, flat and clean with points prominent, to turn neither inwards nor outwards. The hind leg not to be too bent. The hock not to be set behind a line from the point of the quarter to the fetlock joint. Pasterns of proportionate slope and length. Feet well-shaped, hoofs dense. ACTION: Quick, free and straight from the shoulder, knees and hocks well flexed with straight and powerful leverage and well under the body. 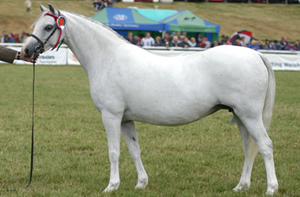 The general description of ponies in Section A of the Stud Book is applicable to those in Section B, but more particularly the Section B pony shall be described as a riding pony, with quality, riding action, adequate bone and substance, hardiness and constitution and with pony character.